GRAND RAPIDS, Mich. – November 16, 2018 – The Mosaic Film Experience (MFE) announced the winners of its 2018 Mosaic Mobile contest during a week of events celebrating creativity and storytelling. Mosaic Mobile is a short-film competition for West Michigan high school and college students where films are shot, edited, and entered on mobile devices. First place winners in the high school and college categories each took home $1,000, second place winners received $500, and third place winners each collected $250. The Rick Wilson Memorial Award winner, which is determined by public vote, won $500. 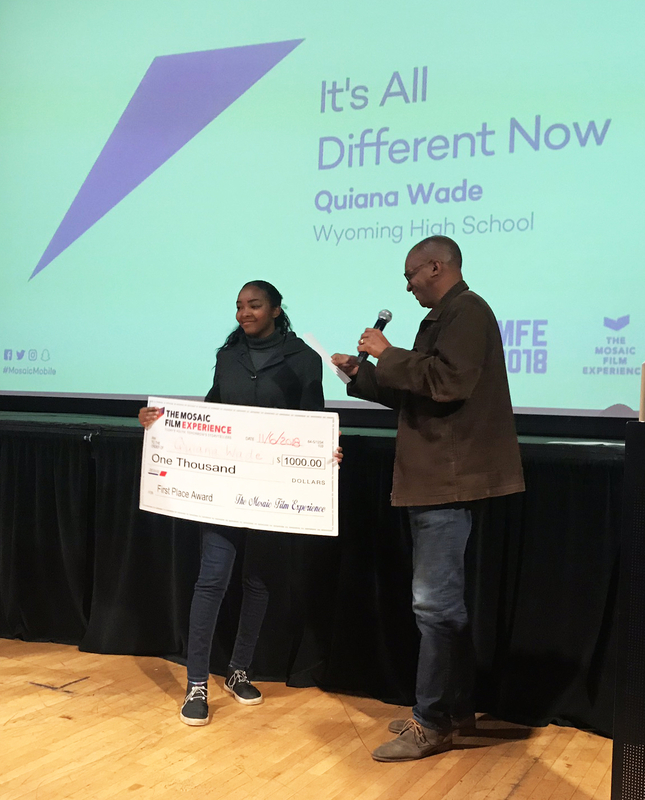 The winners in the Mosaic Mobile college category were announced on November 6, before a special screening of “Black Panther” at Wealthy Theatre. The event also featured a presentation and Q&A session with the film’s costume concept artist Phillip Boutte Jr.
Boutte is a professional costume concept artist who has worked on films such as “Black Panther,” “A Wrinkle in Time,” “Inception,” “Guardians of the Galaxy: Vol 2,” “The Greatest Showman,” and “The Hunger Games.” He specializes in character development, costume concept art, and specialty costume design. The winners in the Mosaic Mobile high school category were announced during the seventh-annual Mosaic Film Experience Event at Wealthy Theatre on November 7 and 8. The Mosaic Film Experience Event is an interactive day that brings the power of digital media and content creation to youth. The event also provides students with access to local and national industry professionals through creative, career-inspiring workshops, and exclusive presentations. In addition to the Mosaic Mobile high school screening and award ceremony, the 2018 Mosaic Film Experience Event featured a showing of the new Starz documentary series, “America to Me,” which was followed by a panel discussion and Q&A session. Breakout workshops feature local professionals from West Michigan Center of Arts & Technology, Kinetic Affect, COM 616, Carbon Stories, Winkle Creative, and comedian Mike Logan. Boutte also presented his work and shared his career journey, and Carla Moore, the vice president of sales strategy and education for HBO, spoke to students about the importance of education, internships, and passion. Eligible Mosaic Mobile films are two to three minutes in length and must meet three requirements: Use “tell a story” as a theme for the film, include some form of art as a prop, and the words “it’s different now,” must be spoken or used in the film. The theme, prop, and words are unique for each Mosaic Mobile contest. Founded in 2011, The Mosaic Film Experience (MFE) is a 501(c)(3) organization that uses the platform of digital media to provide students with an opportunity to tell their unique stories and equip them with the critical thinking, collaborative and creative skills necessary for career preparedness. There are three aspects to The Mosaic Film Experience: The Mosaic Event: An annual interactive experience that provides students access to industry professionals through creative, career-inspiring workshops. Mosaic Mobile: An annual mobile film competition where films are shot, edited, and entered on mobile devices. Mosaic Community: Events ranging from afterschool curriculum to industry guest speakers and film screenings. For more information about MFE, visit http://mosaicfilmexperience.com/.